The 10 Best Beer Gardens in West Virginia! From German-inspired biergartens to comfortable outside patios where you can enjoy an adult libation with friends, West Virginians know how to celebrate life. With choices ranging from casual to quirky, below are 10 of the best establishments in the Mountain State that have outside areas where you can sit back, relax, and enjoy your favorite beer. With a cast of local regulars, Gene’s Beer Garden has been operating since 1944 in Morgantown, West Virginia. Famous for their hot dogs and icy cold beer, 13 on tap to be exact, you’ll learn to feel at home in this friendly place as you enter a simpler time. Listen to and tell stories, watch your favorite sports team, hear great live music every day of the week. You don’t have to travel to fancy high-priced French restaurants to enjoy sweet and savory crepes. Open for breakfast, lunch, and dinner Monday through Saturday from 11 a.m. until 10 p.m. and Sunday from 10 a.m. until 2 p.m., Later Alligator is located in the historical district of Wheeling, West Virginia and is situated in a unique downtown store front that’s been lovingly restored. A true and delicious dining experience for vegetarians and meat eaters alike, you can wash your food down with a cup of organic fair trade coffee or one of the other expresso bar items, a flavored latte, tea, lemonade, soda, domestic, imported and specialty beer, or a house cocktails. Sit inside or outside, but see ya Later Alligator! Step on up to the bar and order your favorite beer of the 33 on tap, or sample a flight to find out which one is your favorite. This popular beer garden has a German-inspired menu to go with the beer they carry. Featured are hearty malt pretzels served with raspberry buckwheat honey butter and Bavarian mustard, and a variety of potato fries called frites that come with finger-lickin’ dipping sauces like apricot curry ketchup, cherry mustard aioli, or blackberry jam, pistachios, and pickled onion. If you’re on the hungrier side, try the house specialty—cranked pork, beef, venison, chorizo, or vegan sausages in or out of the bun, or a classic wiener schnitzel, jagerschitzel or weisswurst and spätzle. Open every day. Not your typical pizza place, Pies & Pints in Fayetteville, West Virginia has comfortable seating inside or outside where you can enjoy specialty pizza pies like the house favorite, Heirloom Tomato Pie. All the pies are hand-made and fresh daily and each crust has roasted garlic oil and salt-infused goodness baked inside. Other specialty pies include the grape & gorgonzola, black bean and cheese, sriracha shrimp, and Cuban pork varieties to name just a few. Round out your meal with an ale or lager, but if you’re not sure what the different is, ask your friendly bartender. What goes better with a cold brew than a plate of spicy chicken wings? Stop by Mario’s Fishbowl in Morgantown, West Virginia and see for yourself. This neighborhood bar has been open since 1949, and had a habit of serving ice cold beer in large goblets purchased by one of the local glass factories. People loved the “fishbowl” of beer then and still do today. WVU students, locals, and visitors passing by can enjoy their food and drinks inside or outside seven days a week. Originally opened in 1864 under another name for five years, Parkersburg Brewing Company produced 60,000 barrels of beer annually. Today, the Parkersburg Brewing Company is at a new location with a modern facility, but the mission is still the same—to provide a great taproom experience for the general public. Serving a three-state area, PBC has some amazing and refreshing craft-brewed beers like From Ash & Ember, an extraordinary ale that epitomizes the story of the PBC. The menu has great starters, salads, and Paninis that make your visit there one that satisfied hunger and thirst. Open Wednesday through Sunday. Talk about an extensive beer menu. Summit Beer Station in Huntington, West Virginia has a great selection of draft beer like stouts, IPAs, sour, pale, and wild ales, Belgian quads, and lagers. They might be a little light on the food menu, but this is a beer station and that’s the main focus. Open every day with seating inside and outside. With over 48 beers on tap and more than 80 varieties represented, Huntington Ale House in Huntington, West Virginia delivers great drinks, great food, and great service. The only thing missing is you. Open for lunch and dinner every day but Sunday, this place is more than just a burger joint, although they have some tasty burgers. If you love spicy food, try the Cajun Chicken Sandwich with your favorite beer. Sit inside or enjoy being outside. If you have an affection for 100 percent fresh beef burgers that are antibiotic and steroid free, this is the place for you. At Bubba’s Burghers and Beers in Highlands, West Virginia, burgers aren’t the only thing Bubba’s does right. In fact, you’ll have 15 different types of burghers from which to choose like the Korean barbecue, bison, and stout & sriracha burghers. 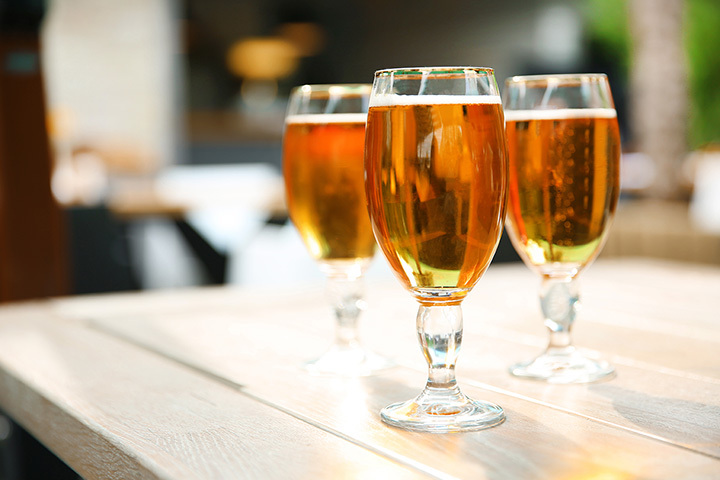 If you’re a beer lover, you’ll recognize quality when you see the wide selection of draft and craft beers available. Open every day. Looking for a place that has an awesome outdoor eating area? Look no further than The Mecklenburg Inn. Located in Shepherdstown, West Virginia is a quaint place where locals come to hang out and enjoy the secret beer garden. The area is lighted at night be tiki torches and the sounds of crickets and church bells. With a nice menu featuring items like Jamaican Chicken and great burgers, you can count on flowing libations like the Guinness. Live music happens every week, and the Inn is open every day.